The Council began its session on Tuesday, March 20, with the Council presenting proclamations recognizing the 41st Annual Prince George’s County Public Safety Valor Awards; honoring Dr. Rita L. Robinson’s induction into the Maryland Women’s Hall of Fame; and acknowledging April 8-14 as “Library Week” in Prince George’s County. St. Christopher’s Church also received a proclamation recognizing its exemplary community service, including hosting “Pop-Up” library activities while the New Carrollton library branch is under renovation. Join your neighbors and community leaders to address the County's affordable housing challenges. Wednesday, April 11th - Laurel High School in Laurel, MD. Refreshments at 6:30 and roundtable discussions start at 7:00 PM. For details, visit Ad-Hoc Subcommittee site. The Prince George's County Council cancelled multiple meetings originally scheduled for March 21st and 22nd due to this week’s snowstorm. Time is winding down toward the end OF the 2018 Maryland General Assembly session, and state lawmakers are focused on getting legislation passed. Monday, March 19 was Crossover Day, the deadline for a bill to pass either the House or the Senate, and be sent to the other chamber for consideration, in hopes of making it to the Governor’s desk. As such, the Rules and General Assembly Committee has been hard at work, monitoring thousands of bills that may impact Prince George’s County residents. Among them is SB 516 / HB 807, transportation highway-user legislation increasing state funding for locally-maintained roads and bridges. As amended, this measure represents an important opportunity for significant state support for restoring this much-needed funding to local governments and municipalities, including Prince George’s County. SB 1122 / SB 1697, is a proposed constitutional amendment that if approved by the voters in the next General Election requires the Governor to provide supplemental State funding for public education using commercial gaming revenues dedicated to public education. The Prince George’s County Council supports this measure because it will mean A $500 million increase in school funding and ensure that gaming revenue in the Education Trust Fund contributes to real progress towards a world class public school system throughout Maryland. 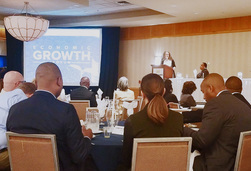 Chair Glaros provided welcoming remarks at the Prince George's County Chamber of Commerce Economic Growth Forum Tuesday morning. In addition to sharing the exciting news of groundbreakings and Transit- Oriented Development projects happening across the County, the Chair also called on our business leaders to deepen their roots in the County by supporting our nonprofits and County youth by partnering with Youth Career Connect, Summer Youth Employment Program and others. Council Vice-Chair Todd Turner has been conducting ‘Listening Sessions’ throughout the Fourth District. 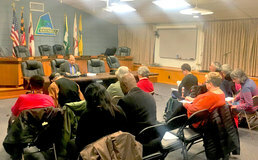 Council Member Turner held a ‘Listening Session’ with Greenbelt residents on March 15th, and a second ‘Listening Session’ with Glenn Dale/Lanham residents on March 22nd. “I want to thank the residents and members of the Greenbelt City Council that attended my Greenbelt Listening Session, and all who attended the session in Glenn Dale/Lanham. These sessions provide an important opportunity for dialogue on issues and concerns about the County as we head into our annual budget consideration.” The final meeting, scheduled for Bowie residents, will be at 7:00 p.m., on Thursday, March 29th, at the Kenhill Center in Bowie. County Council Member Derrick Leon Davis hosted his Annual State of District 6 event on March 3, a breakfast briefing event at the Doubletree by Hilton in Largo which drew over 100 constituents. State elected officials, County agency representatives and community partners also participated. 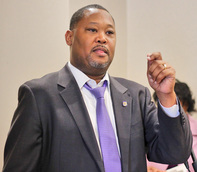 From the Regional Medical Center to the Continuous Improvement Process/Study of Prince George’s County Public Schools, residents were provided updates by Council Member Davis on numerous Countywide legislative matters. Other topics included the County’s Comprehensive Housing Strategy, the Administrative Hearing Process (led by the Department of Permitting, Inspection and Enforcement), and the work of the Blue Ribbon Commission on Addressing Prince George’s County’s Structural Deficit.